10mm Wargaming: Save Hanging Rock + 5 More Southern Campaign Sites! Save Hanging Rock + 5 More Southern Campaign Sites! After the British captured Charleston in 1780 during the American Revolution, they began establishing outposts throughout South Carolina to suppress the Patriot insurgency and rally what they assumed was a latent Loyalist majority. In July 1780, militia leaders Colonel Thomas Sumter and Major William Davies, and their combined force of 800, agreed to attack the British outpost at Hanging Rock in South Carolina’s northern frontier. The Patriots achieved complete surprise on August 6, 1780, 236 years ago today. The British and their Loyalist allies attempted to organize a defense, but the Patriots responded coolly: they “took instinctively to the trees and bush heaps and returned fire with deadly effect.” News that British reinforcements were on their way stalled the attack, but the damage had been done. Two hundred British and Loyalists lay dead or wounded and the Loyalist faith in British arms was greatly shaken. The Battle of Hanging Rock was the beginning of a series of events that turned the tide in the South and ultimately, the American Revolution itself. We have an unprecedented opportunity to save acres of hallowed ground that witnessed this little known, but vitally important, chapter in our history. At Hanging Rock and five other sites in South Carolina, we have the chance to preserve more than 1,000 acres where our independence was won. 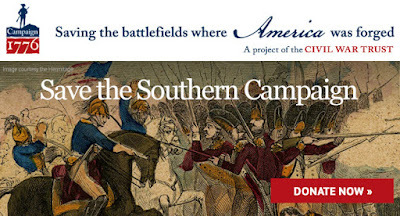 The land we are working to save today will go a long way toward educating and interpreting the Southern Campaign of the Revolutionary War, one of the defining events in American history. Please join me in this noble effort. P.S. Thanks to an incredible set of matching funds, every dollar you donate will be multiplied by a factor of 37 for a $37.57-to-$1 match. Take advantage of this opportunity and help save the land where our independence was won.